My daughter started a club at her HS last year called Read to Me. High school students go to the Elementary School and read to the Kindergarten, 1st and 2nd grade classes. Most of the teachers they visit are the ones they had as young children. How great is that? Today, my daughter went to her brother’s former Kindergarten teacher, as she does every week. 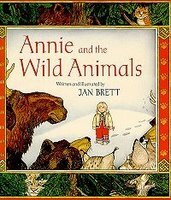 She read the Annie and the Wild Animals by Jan Brett. We are big Jan Brett fans in this house. Annie is one of our favorites, we even have it signed by Jan Brett. It is the end of winter and Annie wonders what is wrong with her cat, Taffy. Taffy has become quite lazy and doesn’t want to play with Annie. Annie tries to make new friends with the animals in the forest. As Winter begins to thaw she discovers why Taffy has disappeared. As always, Jan Brett’s illustrations are perfect, the borders and the illustrations themselves telling as much of the story as the words. Jan Brett never disappoints! (unfortunately there are no hidden Hedgies 璉 in this book). And, check out www.janbrett.com. There are lots of activities, coloring pages, etc. A great resource for teachers.